(PAAES/UFU – 1ª Etapa − Subprograma 2010- 2013 − adaptado) Leia o texto a seguir e responda as questões apresentadas. We snack, talk on our cells, even shave and apply makeup while driving. Is it worth the risk? Max Alexander reports from the road. It was dusk, and a typical New England fog was rolling in as Daniel Voutiritsa cruised up the Maine Turnpike to his home in Sanford on March 20th, 2003. Voutiritsa, 32, was behind the wheel of a rented Ryder box truck he was driving for Stericycle, a medical waste disposal company. He was alone but talking on a handheld cell phone with his wife. When his exit came up fast, he swerved from the middle lane to the right to get off the highway. Apparently he didn’t notice the car next to him in the slow lane. His truck hit 38-year-old Zack Gaulkin, an editor who was headed home to Kennebunkport from his job near Boston. To save gas on the 200-mile round-trip, Gaulkin drove a compact Toyota Corolla wagon. The truck clipped the Toyota’s rear and catapulted the car into the fast lane, directly in the path of a 60-foot-long, 40-ton tractor trailer. Gaulkin’s widow, Terri, was left to raise three small children. — The National Highway Traffic Safety Administration (NHTSA) and the Virginia Tech Transportation Institute found, in a study released in April 2006, that the vast majority of accidents − nearly 80 percent − could be prevented if drivers paid more attention. — Nationwide Insurance, which conducted a survey in November 2006, suggested that distracted driving is a national pastime. 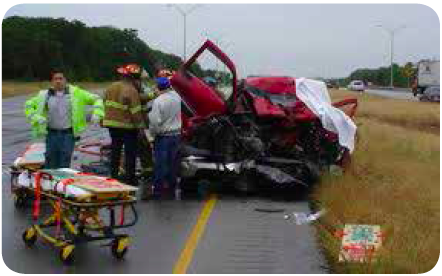 Of 1,200 respondents, ages 18 to 60, 73 percent said they use a cell phone while driving; 68 percent eat while driving. Others shave, read, even paint their toenails in traffic. — Gadget-obsessed teen drivers are perhaps the most distracted. In a national survey from State Farm Insurance and the Children’s Hospital of Philadelphia released in January, more than half of teens polled said they saw other teens driving while text messaging or using handheld games and other tech gear. Technology, responsible for so many driving distractions, may hold a key to prevention. John Ulczycki at the National Safety Council says cell phone manufacturers are developing phones that automatically disable nonemergency calls when the driver is in motion. He says one company (he’s not allowed to identify it) claims its phone will be able to distinguish if the caller is actually driving a car or, say, sitting on a moving train. Car manufacturers are also rising to the challenge. Steering wheel controls for radio and climate, now common, make it easier to stay focused on the road. Some luxury cars include cameras that monitor the driver’s gaze and sound an alarm during a distracted moment. Engineers at the University of Minnesota are developing a smart camera that monitors hand, arm and head movements. Another factor will be smarter road design, including the increased use of rumble strips. By Max Alexander - adapted from the Reader’s Digest - October 2007. Marque, para as afirmativas abaixo, (V) Verdadeira ou (F) Falsa. was driving his own truck when he crashed into a car. crashed into a tractor trailer because he was talking to his wife. crashed into another car because he was distracted by his cell phone. was responsible for the death of a 38-year-old man.